Climbing along a dirt path, past roosters running around, past kids playing a game of tag barefooted, past a woman hanging laundry on a wired fence, there is a hill that overlooks a colonial town. Lying on the southern coast, Trinidad is probably the most-visited town in Cuba outside of Havana and Santiago de Cuba. I wouldn’t have known it standing on that hill with the beautiful view of the narrow cobblestoned streets and bright pastel-colored buildings with red-tiled roofs. There were a few young boys flying kites and arguing when one string got tangled with another, oblivious to me or the old dilapidated church on the hill. 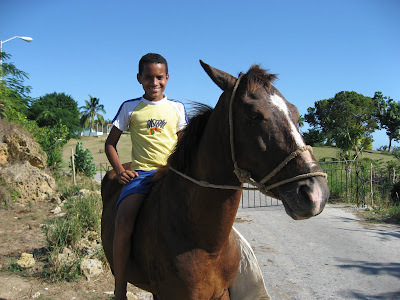 I wandered down a path and met a young boy, Daniel, who was fixing a rope around his horse’s nose so he could ride it home. I took a picture of him sitting on his horse. He couldn’t stop smiling when I showed him the picture and told him I’d mail it to him when I returned to the United States. A group of smaller kids gave Daniel jealous looks as he rode by them. The smaller kids had asked me for money. Daniel didn’t ask me for a thing. I didn’t give them money; I didn’t take their picture. It happens each day here at the same time. Yet few visitors give it more than a passing glance. I learned a lot on a basketball court on the edge of town. 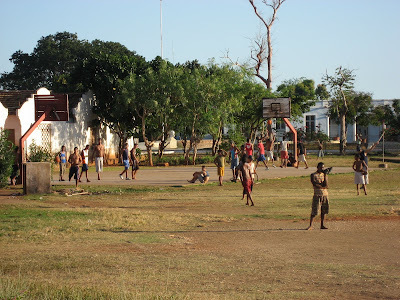 It was a typical slap of concrete next to a dirt field with patches of grass, where local children congregate for games of basketball and baseball. I wandered over, intrigued. My guidebook didn’t even mention this area, but it was across the street from the town cigar factory so it’s not completely obscure. I joined the young men, high school and college aged, in a pickup basketball game. At the end of the first game I asked the tallest player on my team why he and many others played barefoot. He said they couldn’t afford shoes. 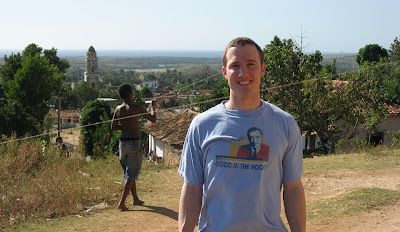 His answer surprised me; it was my third day in Cuba. A few games later a shorter player challenged me to a game of one-on-one. I gladly accepted. Tourists come to Trinidad for its pastel-colored buildings and red-tiled rooftops. They come here for the traffic-free cobblestoned streets and old churches and beautiful Carribean beach. They don’t come here to play basketball. That’s why the other kids gathered around to watch us play. One kid kept taunting me in a playful manner, calling me “The Soviet.” I won the game but it felt inconsequential. The kid I beat had borrowed a friend’s old sneakers to play me. After the game I shook hands with the kids I played with and said goodbye. As I walked away the kid I beat said they play every day at the same time. He asked me to come back the next day. I wanted to return with sneakers. It took me a while wandering the dark cobblestoned streets but I found her house. I had met Yilieny in the weirdest way. The day before I used a port-a-potty on a bus. While peeing, the latch on the outside of the door locked me in. I knocked on the door and Yilieny opened it. 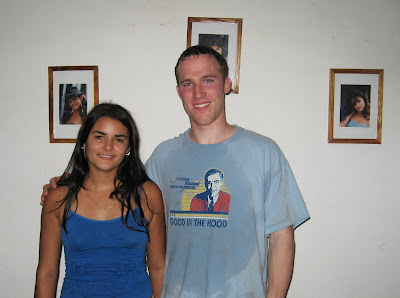 She was a good-looking Cuban girl. She spoke no English. She was the first person I had ever met who had never heard of Muhammad Ali, Michael Jordan, or Pele. However, as a writer I was glad she knew of Ernest Hemingway. Now it was the following night and I was returning to give her a small gift, a T-shirt with a map of Illinois and its landmarks on it. I had stopped by an hour earlier to say hi. My gift paled in comparison to the one she had for me. Her father, Osmany, had cooked a huge dinner for me. I hadn’t met him yet. He prepared the traditional rice and beans, and the cucumber and tomato salad. But he had given me the best he could offer – two large lobster tails, and two hamburgers with ketchup on the table. I smiled inwardly knowing he had cooked hamburgers because he knew I was American. I was taken back by the whole meal. For visitors, Cubans put each dish on a separate plate with an empty plate for you to fill as you eat. The rice is in one dish, the beans in another and so on. So half of the table was full with these dishes and it was all for me. I thanked Yilieny and her family profusely and asked them to join me, but they said they had eaten while I was gone. When they asked me what I had done with my water bottle I had just purchased, I told them I left it back in my casa particular. Then they sent Cesira, Yilieny’s younger sister, to a convenience shop to buy me a bottle of water for my meal. I said they didn’t have to, but they insisted. Before I had finished dinner, Yilieny said goodbye. She had to finish her homework. There is a large dance floor with round tables and chairs set up around it and a set of multi-colored disco lights on various spots along the cave’s ceiling, anywhere from thirty to forty feet high. On one side is a normal-sized bar lined with colored lights and on the other side a long stairway built into the cave that leads to the highest point where the DJ booth is. It was like nothing I had ever seen before in my life. At the bar I saw the tall kid on my basketball team from earlier. We shook hands and sat down and had a drink with his friend. My tall teammate was the DJ from 11 p.m. to 3 a.m. seven days a week. He also woke up early in the morning for school. I didn’t know how he managed to attend classes, go play basketball and DJ on a regular basis, but he said he enjoyed it. Later on, I climbed the stairs and chatted with my friend in the DJ booth. It was fascinating looking down on the crowd, a mix of locals and foreigners mostly in their twenties, dancing to music pumping from loud speakers while drinking inside this giant cave in an old Cuban colonial town. Whoever decided to turn this enormous cave into a discoteca instead of another daytime guided-tour spot was a genius, I thought. My DJ friend must have had at least a hundred records, playing Cuban songs with a mix of American pop songs. (Although Cubans enjoy salsa and son, much of the younger generation listens to reggaeton music – a mix of hip-hop, reggae, and dancehall music. It had a much different sound to it than the reggaeton played in America. Perhaps more Cuban. However, many Puerto Rican artists are popular in Cuba, in particular Don Omar. His name or face appears on T-shirts and tank-tops all across the country.) He also had a button to turn the lights on and off, and another button that controlled whether the colored lights blinked, rotated, etc. So this was where all the tourist money went, I thought. The lights were not nearly as impressive as what happened next. At 12:30, a few Cuban males, in their twenties and buff, stepped onto the dance floor. They wore Cuban-colored pants – red, white and blue – and one of them wore a Cuban flag bandana. They were shirtless but it wasn’t just for show. They cleared the dance floor and performed various stunts – chewing glass and breaking empty Habana Club bottles on their heads without any blood or marks. One guy chose a big, husky white male to stand on his chest while he lied on broken glass. No marks. They also lifted a normal-sized table without moving drinking glasses on it. Oh yeah, they lifted it with their teeth! When they were finished, the music played again. With a Cuba libre in hand, the only thing missing was my camera. This story first appeared at The Traveler's Pen in March 2007. Although set in New Orleans in the 1960s, this satire on society is timeless. 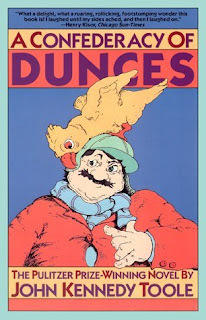 Published posthumously (John Kennedy Toole committed suicide and his mother discovered his manuscript), its protagonist, Ignatius J. Reilly is a fat, college-educated thirty-year-old who lives alone with his mother and has a fussy “valve.” As he ventures into a world in dire need of “taste and decency,” he stumbles into many “mongoloids” and “degenerates.” I found myself laughing out loud, which I rarely do when reading a novel. Each chapter has an interesting twist with the final pages unveiling Toole's genius as a storyteller. In many ways this book compares to The Catcher In the Rye, only this book is better. There have been high expectations for Marvin Williams since he helped the Tar Heels win a national championship last season and was then chosen as the second pick in the NBA draft. This season Williams averages 6.6 points and 4.5 rebounds per game off the bench for the struggling Hawks, who lost to the Bulls at the United Center on Saturday night despite Joe Johnson’s 40 points. Williams showed flashes of brilliance, tallying a team-high in rebounds (10) and steals (3). An hour and a half before tipoff in Chicago, Williams stepped out of the visiting locker room munching on a piece of fruit. I introduced myself and he stuck out his fist and apologized about his dirty hands. I told him I graduated from Carolina in 2004. Dressed in his Hawks warm-up uniform, he smiled and said, “Damn, I graduated from high school in ‘04.” We stood outside the entrance to the court and chatted about the life of a 19-year-old NBA player. BG: I saw you last summer near Time-Out with a Hummer. Are you still driving around in it? MW: No. I was test driving. It was something I was looking in to. It’s an all right car. I liked it, had it for a little over a month. BG: What are you driving around now? MW: I have a black Denali. BG: How do you like living in Atlanta? MW: I like Atlanta. Atlanta is a nice spot for me. It’s not too far from Carolina. I like it. It’s a nice city. BG: How do you feel being so far from Washington and living on the East coast? Does your family still live in Washington? MW: My dad lives in Atlanta, so it’s not bad. He moved there when I got drafted. So he’s there with me. Two of my roommates from back home live with me. But it’s not hard being away from my family anymore. It was tough when I first came to school, but that year was big for me, so it’s not tough anymore. BG: What are your thoughts on being in the NBA and the NBA lifestyle? MW: I like it. I mean, it’s kind of boring. There’s a lot of time, a lot of free time. But it’s fun. Night in and night out you’re competing against the best guys all over the United States. So it’s pretty fun. BG: What do you like doing in your free time? MW: I watch a lot of movies. I watch a lot of movies. I play pool a lot. That’s about it. BG: I heard Raymond and Rashad are pretty good at pool? MW: Yeah. Rashad’s pretty good. Ray’s pretty good actually. I’m not too good. I’m getting better. BG: What movies have you seen lately that you’ve liked? MW: That I liked, hmm. I heard Flightplan was pretty good. I meant to watch it today. I think I’m going to check that out tomorrow. BG: What’s your all-time favorite movie? MW: Probably Coming to America. BG: What’s your biggest surprise in the NBA, on and off the court? MW: The biggest surprise for me is how good people really are. I mean, you see it on TV, but it’s another thing to play against them. When you turn on the TV and see Kobe having 81 points. I mean, you don’t think something like that is possible. So I think that’s the biggest surprise for me. I knew guys were good coming in, but I didn’t really understand how good guys really were. BG: What about off the court? MW: There’s a lot of free time after practice. I’m home at 2:30 waiting for the next day to come around. So that’s pretty much it. BG: Who do you hang out with? MW: My roommates. Josh Childress some times. He’s kind of my best friend on the team. BG: Do you ever think about Chapel Hill? MW: All the time. All the time. I watch the guys play, saw them play today against Arizona, got a big win. I talk to the guys all the time. MW: Oh yeah, oh yeah. I talk to the coaches, all the coaches. I talk to the players a lot. Quentin Thomas is still my guy. We don’t go two days without talking. MW: Oh yeah. We always talk. But I still talk to everybody, so. BG: What do you miss most about college? MW: College is a great life, especially for a young person. I had a great time, it was really fun. I would have loved to go back. But certain situations didn’t allow me to do that. I had a great time. I had a really fun time. BG: Try not to look back? MW: Yeah, yeah, definitely. I’m definitely excited about my future, there’s no question. I know where I’m at right now, no doubt about it. This interview first appeared in Tarheeldaily.com in January 2006. Below is a short synopsis of my first published book, titled "The Monk". Although Steve “Monk” Williams has lived through the best and worst of times, his unbreakable spirit and quick wit have touched everyone who has known him. He traveled around the world and met numerous friends as a skier and coach for the U.S. Ski Team. In the process he earned two Ivy League diplomas. Then came hardships and tragedy, one piled on top of another. He was fired as coach. Soon after, Monk was diagnosed with multiple sclerosis, an illness that slowly took away his job, ability to speak clearly and ability to walk. MS didn’t, however, weaken his spirit. Neither did the sudden death of his wife, nor his isolation as the youngest resident in an assisted living home. Monk’s room is filled with photos and lingering vestiges of his past. He says cross-country skiing for the national team was the answer to his insecurities and that it proved he was “a stud.” Since moving from New England to Colorado, Monk has become a stud again— skiing, biking, rafting, and participating in a local program for handicapped people, always with a big smile. He also has an incredible knack for one-liners. 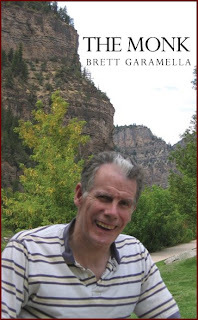 He sends his family and friends, whom he calls “Monk’s Mafia,” humorous e-mail accounts of his outdoor adventures. The Monk will make readers laugh and feel inspired to make the most of their own lives. If there was one story I wished I had written or one book I'd bring to a deserted island, this is it. The funny thing is if I gave you a synopsis of it, you might not be that interested. 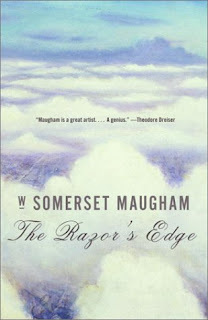 However, W. Somerset Maugham makes this great story a masterpiece. The protagonist, Larry, is in search of himself, leaving luxury and social norms for a life of study and understanding. Through his time as a soldier and voracious reader and vagabond he learns the path to salvation is like a “razor's edge,” a narrow road to cross. If you're not married or don't have children, read this classic now; it'll give you a better perspective of your own life.